The pair performed the classic song "In Spite Of Ourselves" at this year's event. 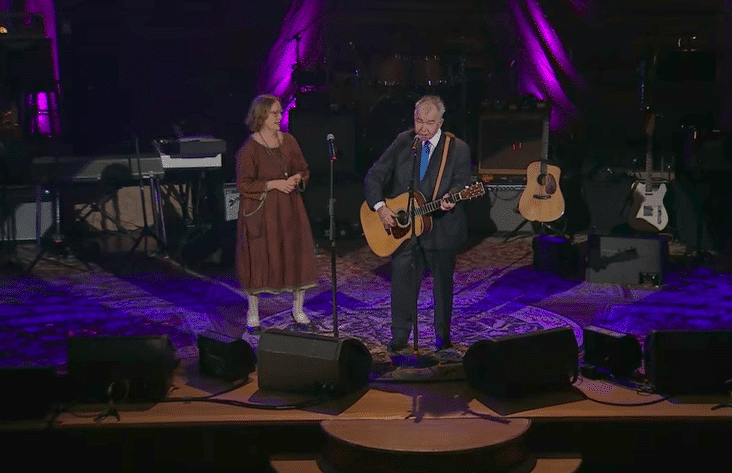 Fans who attended this year’s Americana Honors and Awards ceremony at Nashville’s Ryman Auditorium knew they were in for a treat when John Prine and Iris DeMent walked on stage together. The pair performed “In Spite of Ourselves,” a 1999 cut (off Prine’s album of the same name) that has become a favorite among fans of both iconic Americana artists. Ahead of the broadcast of “ACL Presents: Americana Music Festival 2017,” the Americana Music Association has shared a video of that very performance, which features the pair accompanied by just Prine’s acoustic guitar. The forthcoming special features a number of performances from the awards show, which took place on September 13 as part of the larger Americana Music Festival. Performers include Jason Isbell, Van Morrison, and Rhiannon Giddens. Elsewhere during the ceremony, Prine took home the Artist of the Year award, while DeMent was honored in the Trailblazer category of the show’s Lifetime Achievement Award. “ACL Presents: Americana Music Festival 2017” airs November 18 on PBS (check your local listings for more details). Watch Prine and DeMent perform “In Spite of Ourselves” below.